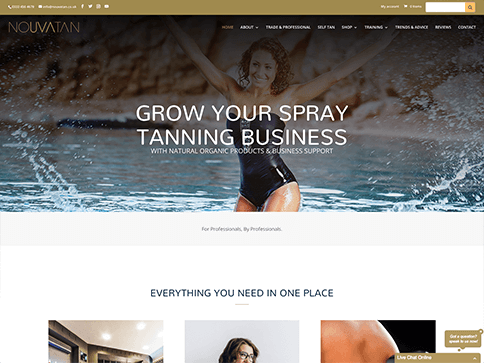 Nouvatan is a supplier of spray tanning products & equipment based in Worcestershire. They approached Nettl to help them to revamp their brand & develop their online presence with a goal of becoming the market leaders in their industry. We created a new brand style & developed this across a modern website layout which is adaptable on all devices. 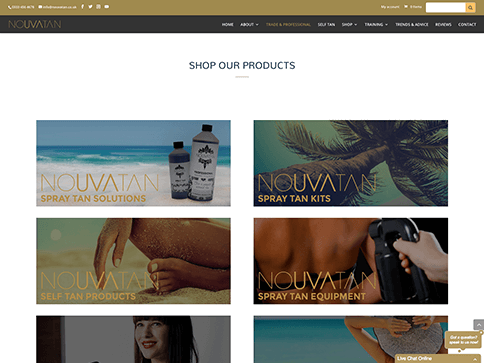 We photographed their products & improved their customers shopping experience by improving the navigation structure, search facility, website content & aesthetics. We developed a more dynamic approach to their trade & wholesale side of the business by creating a unique secure login for all trade customers who could then see dynamic pricing for all trade products – something which would not show to any retail user. Since launching their website we have helped to develop their brand, marketing material & general present within the industry which has already seen a great response & new enquiries.